Sold Out - For Informational Purposes Only (details) This item is NOT FOR SALE. We do not expect any further shipments of this item and are keeping it on our website for informational purposes only. Shopping for Marilyn Monroe Bed and Bath? Take a look at our huge selection of Pop! Vinyl Figures, Action Figures, Statues, Mini-Figures, Construction Toys, and Key Chains! Who wouldn't want to cuddle up with Marilyn Monroe! If that's always been a dream of yours, your time has come… sort of. 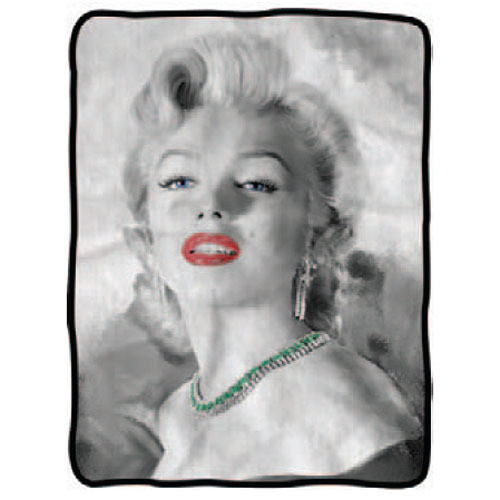 The Marilyn Monroe Red Lips Fleece Throw Blanket features an alluring image of the Hollywood bombshell in black and white, with just a touch of red at the lips and green around her neck. It measures 60-inches tall x 45-inches wide, ready to embrace you. "This is an absolutely amazing website! Great prices, amazing customer service and quick shipping on great quality products!" "This is an absolutely amazing website! Great prices, amazing customer service and quick shipping on great quality..."